Very recently, author Kevin Donihe visited Rotterdam, the Netherlands to attend the UBIK: FUTUROSITY festival! While he was attending, Donihe was given a microphone and thrown in front of a crowd, because this is what you do with Kevin Donihe. 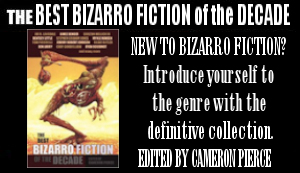 The result is one of bizarro fiction’s top writers sharing his thoughts on weirdness and cavemen. Don’t fear the weird. Embrace it. Open notebook or turn on computer. Think about what you are going to write. Write the stuff you thought about. Look over this stuff; revise it. Email finalized poem to some editor or another. Link hands with Don and Glenn, Joe and Timothy; open your third eye and focus energy until it fills the cosmos with a previously unknown love of poetry. Enjoy quality conversations with plant and animal spirits; glimpse the Godhead. Wait for your working to fail. Kevin L. Donihe, perhaps the world’s oldest living wombat, resides in the hills of Tennessee. 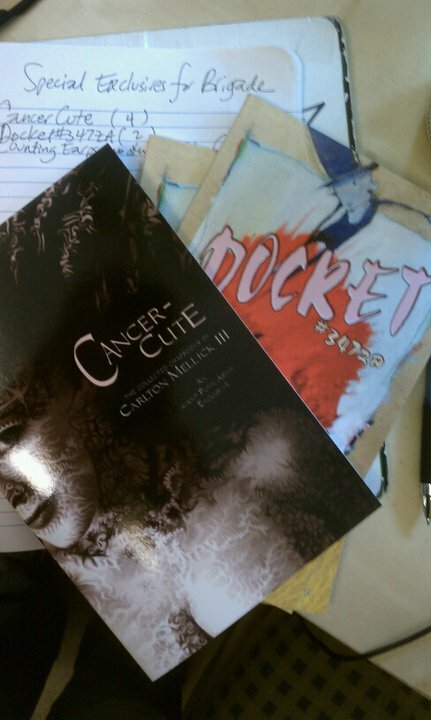 He has published more than ten books via Eraserhead Press. 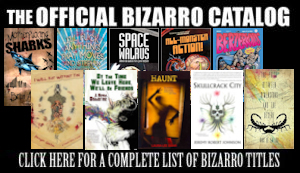 His short fiction and poetry has appeared in Psychos: Serial Killers, Depraved Madmen, and the Criminally Insane, The Mammoth Book of Legal Thrillers, ChiZine, The Cafe Irreal, Electric Velocipede, Poe’s Progeny, Not One of Us, Dreams and Nightmares, The Best Bizarro Fiction of the Decade and other venues. A master of meditation sat on the floor of his custom-designed chamber. There was no washtub, no toilet. No accoutrements or conveniences of any kind. A glass of water was the only thing he could drink, a piece of flatbread the only thing he could eat. Years before, the master had cut away the dross in his life. He’d retired early from a job, floated away from friends and family members. Perhaps he’d missed some of them at one point, but no longer. On the twelfth day of a two-week marathon session, the master sensed a presence in his chamber. Opening his eyes, he saw a man dressed in a white, seamless robe, sitting in the lotus position across from him, knees almost touching his own. “Who are you?” asked the master. “I’m you,” said the man. This man’s robe was identical to that of the master. His face was identical, too. But a red and angry wart grew by his nose. Never had the master suffered such an indignity. This man was not the master. The master found him repulsive, yet the master was a handsome, well-built man. Clearly, something beyond his double’s form had triggered the negative thoughts. Eyes locked on the man, the master peeled away psychic layers to glimpse flesh-hidden truths. His guest, it seemed, was a foolish seeker who mimicked the words and actions of others yet imagined himself wiser than any guru. He forged a circular path, which he saw as linear. Smug yet undeserving, his capacity for self-deceit was limitless. Deeper still, his psyche was twisted-up, his moral compass broken. His aura was brown and sludgy, as if tainted by too much time spent in storm cellars or basements. His soul was cancerous. No doubt he was the sort who would drown kittens and puppy dogs in bags. If he had a wife and kids, he’d beat them. Yet there he was—sitting before the master, pretending that he shared his wisdom and was privy to all his secrets. The more the master dwelt on him, the more he realized he didn’t want to just mourn and pity the man. He wanted to rage at him for wallowing in his limitations, for being a laughable human, a phony and a fraud. Hours passed. Still, the man mocked the master with his presence. “I hate you,” said the master. One of the master’s fists curled. He was tempted to punch the man’s throat. “Why are you even here?” he asked. “Can’t say,” the man said. Anger drained from the master. Once again, his mind felt unburdened and receptive. Closing his eyes, he found and linked up with his luminous self. Two days later, the sound of a buzzer returned the master’s consciousness to flesh. He sipped water, nibbled flatbread. He broke the lotus position with slight regret. Warmth flowing back into his legs, he leaned over to massage them, but stopped, looked around the chamber instead. It wasn’t that its atmosphere had turned oppressive, or he had another visitor. Things simply seemed… backwards. No matter. He began to rub his quadriceps. When he reached his calves, it dawned on him. In his chamber, while meditating, he always turned away from the door. Now, however, he faced it. Reaching up to his nose, the master felt a wart. 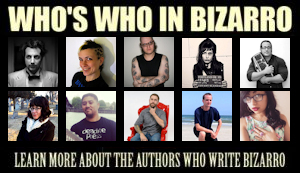 Kevin L. Donihe is one of the most beloved Bizarro authors in existence and an editor for Eraserhead Press. He is the author of House of Houses, Night of the Assholes, and Space Walrus (among others). He is also the editor of the definitive anthology of walrus-themed fictions: Walrus Tales.